ALGIERS, Algeria (AP) — Algeria’s ailing president said Sunday that if he wins a fifth term in April, he would promote political changes that his critics have demanded and call an early presidential election in which he would not run. The longtime leader also vowed to immediately call a “national conference” to set a date and prepare for another presidential election. Bouteflika’s decision to run next month has prompted rare, massive protests in recent days. Bouteflika was first elected in 1999. Questions about his fitness for office have grown since he suffered a stroke in 2013 and remained largely out of public view during his fourth term. He turned 82 on Saturday and underwent medical checks in Switzerland last week. Neither the government nor news media reported if he was back in Algeria. Although the president’s office earlier had said Bouteflika intended to run again, his candidacy wasn’t formal until Sunday. Bouteflika’s campaign chief, Abdelghani Zaalane, filed the president’s candidacy papers Sunday at the Constitutional Council in Algiers, the country’s capital. Hundreds of students took to the streets to denounce the new bid. About 10 vans transported Bouteflika’s documents to the building, according to an Associated Press reporter at the scene. Elevated security measures were in place in Algeria’s capital and especially around the Constitutional Council. Sunday was the deadline for candidates to the April 18 presidential election to file their documents. 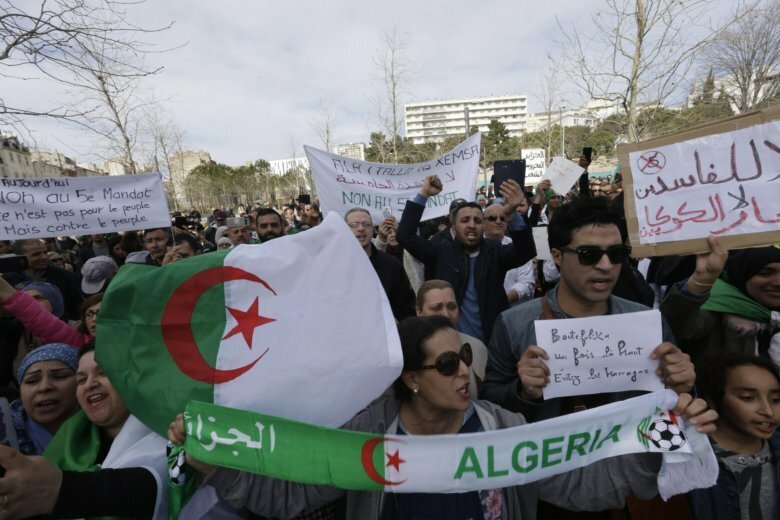 In France, thousands of people from the European country’s Algerian community also rallied Sunday in Paris and in the southern city of Marseille to oppose Bouteflika remaining in office. Bouteflika’s major opponent during the 2004 and 2014 presidential elections, former Prime Minister Ali Benflis, announced Sunday that he would not challenge the incumbent this year.